If you’re looking for a great way to add some uniqueness to your event setup, or if you want to emphasise a specific theme, table centrepieces are an excellent way to go about achieving this. These kinds of centrepieces are comprised of one or more elements that contributes greatly to the overall look of the table. 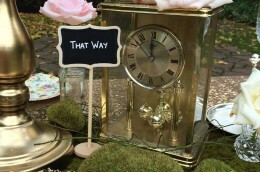 The more elaborate layouts like our Alice in Wonderland centrepiece are made from several pieces –our Alice in Wonderland setup is made up of a variety of vintage clocks, jars and vessels which give it a real fantasy-like feel. Table centrepieces are a great idea for an event because they can be so very versatile. If you would like to embrace a theme, such as Christmas, Casino Royale or Mexico, one of our custom layouts will really make your event unique. Although Table centrepieces are a great prop to hire for your event, we especially suggest using them to make your Sydney wedding completely unique. Depending on what your tastes may be, we can create wedding reception decorations in Sydney that perfectly reflect your personality. This translates to your big day being a true reflection of you, rather than wedding theming someone else devised on your behalf. Want to know more about our table centrepieces? If you’d like to know more about the table centrepieces we have available, or if you would like to know how centrepieces can be incorporated into your special event, don’t hesitate to get in touch. You can reach us by sending a message through to us via our enquiry form, or if you’d like to speak to one of our staff you can call us on 02 9982 6705. We look forward to personalising your event so it’s remembered for years to come!